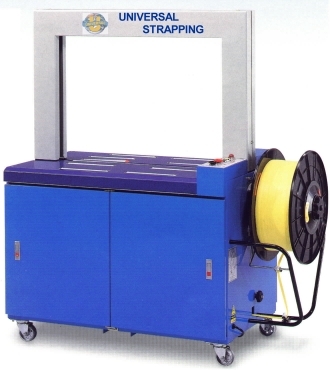 The UNIMATIC AM-1680 can handle all your strapping needs at speeds as high as 26 times per minute. Packages are positioned, tensioned & sealed automatically. It can handle a wide range of sizes, shapes and tensioning requirements. it can be used with either 3/8" or 1/2" strapping. The foot-pedal allows for hands free operation. The oilless mechanism does not attract dust and dirt so maintenance is kept to a minimum. The externally mounted coil makes reloading simple and fast. The AM-1680 assures you of years of trouble-free operation. Universal's many options allow you to customize a machine to suit any specialized application. Strapping Width Available 3/8", 1/2"
*Arch Size 23.6" x 33.4"
Table Size (L x W) 43½" x 27½"